1. Resistance and Doubt – the biggest obstacle standing in your way is you! As we move towards our potential and purpose our negative inheritances and patterns often get in the way. They raise doubts and generate internal resistance. We wonder if we are indeed capable of change as the mind struggles to find the evidence that a new belief system is possible. 2. Duality and Conflict – as you choose to embrace the new positive messages, a tug-of-war with the past and all that you have been, ensues. However, if you choose to patiently apply your growing knowledge and understanding of the human condition, you are destined to move forwards. 3. Acceptance and Integration – the inevitable fruit of patience, practice and perseverance is acceptance. Acceptance enables us to let go of what we are unable to change and change the things we can. It makes us whole and as a consequence we are able to reconnect with ourselves and find peace and contentment. 4. Self-Realisation – a contented mind knows itself and better understands its environment. Because there is a lack of internal conflict it is able to see clearly. Self-realisation is the doorway through which you can pass into a fulfilling life and all things can then be experienced and understood. 5. 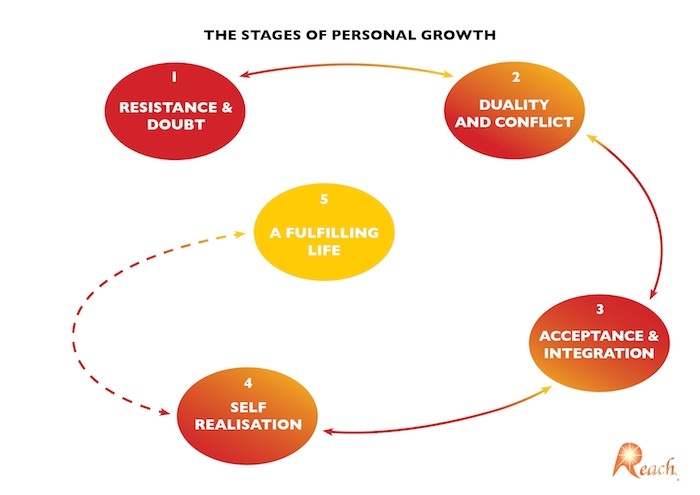 A Fulfilling Life – once you have moved through each of the four stages you are able to find peace of mind…. there is no joy like it. This is not a journey anyone can take for you, you must find the courage and fortitude to take it for yourself. A fulfilling life is a gift we’re all entitled to and when we find it we discover it’s the beginning of our journey, not the end. Push, again and again, beyond your resistance and doubt and there you’ll find your joy!